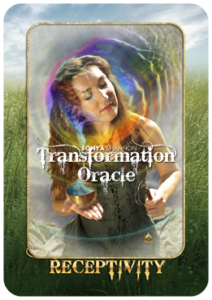 When reflecting on my last two years, using the Transformation Oracle to represent phases along my journey, I realize that I was gifted many blessings. During this period, I have been recovering from a closed head injury resulting from a motor vehicle accident. Headed to work in the early hours of the morning I was rear ended. My vehicle ricocheted off a concrete divider. As I settled into the still moments after the collision I knew something was different. Soon after I was diagnosed with post-concussion syndrome. Head injuries come with a lot of unknowns. Understanding healing became a physical, mental and spiritual process. The card Rebirth serves as an accurate representation of the first days and weeks after, what I now refer to as, my Awakening. Fire clears the way by creating transformation on a physical level, unlike any other element. This blaze crossed into all areas of my life, including spirituality. The flames penetrated their way into every aspect of who I was, who I was beginning to become. I awoke slowly into each day. First, I would become aware that sleep had ended; feeling the pangs of a severe migraine or the residual effects of narcotics, or both. Opening my eyes was a struggle. The light beyond my lids held a world of uncharted visual stimuli that sometimes contorted into uncontrollable emotions or dizziness. Tenderly, I would sit up. Flashes of the past few days had me reliving many moments. Imbedded in my thoughts was the impact, that moment that jarred me awake at night. What is really going on? Do I feel better today? How long does this last? Where am I? Deep breaths. Relax. Prepare for the next step. Turning my body to get out of bed I would feel my feet dangling. Was the floor really that far away? By leaning slowly towards the edge of the bed, I would find my footing. Gradually I would stand, brace myself with the wall, and then wait for the rush. At this point each day there was a gauge of recovery. Judging by how I felt in that moment I was able to get grip on what this day might be like. Though my first steps were often uneasy, I took those steps every day. Mentally I struggled with many new demons. A bruised mind can create a never ending stream of vexing thoughts. Memories were not always accessible or even clear, but I knew I had them. While focusing on the cultivation of recovery, being present was the best way to keep me out of trouble. What I did not see was the rainbow of infinite possibilities laid before me. I would, in time. The most consistent term from doctors, family, friends, and my living angel and caretaker, Cassie, was rest. 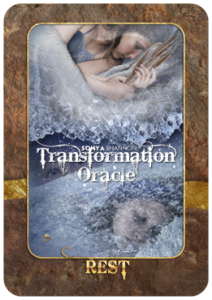 I believe in Synchronicity; Rest was the first card I pulled from the Transformation Oracle deck. Rest was prescribed in the traditional framework as well as not too much light, no iPhone, limited television. What is left to occupy my time? Rest, that’s what’s left. Cassie was ever vigilant with my care. Countless times she took my phone away or turned off the television. Quietude. Grounding. Meditation. The brain takes time to heal. I have not always been patient with myself. Messages all around me were to take it easy and heal, and rest. While remaining quiet and still many things surface. Sometimes questions, other times answers, recurring thought patterns, the type of things you are left with when the world is shut out. Often I would convince myself that getting things done, anything really, would help with the continual conflicts firing away at will in my consciousness. Who would I be after all this rest? Anxiety crescendoed in devastating, debilitating whirlwinds leaving me grasping for a foothold anywhere to stabilize. Unlike any stress I had experienced before, I admit this level of anxiety overloaded my circuits. I was a vigilant rabbit, ready to react to anything that moved or made any noise. That turned out to be a lot of things. Was this to be a way of life for me now? The doctors and therapists said some of these feelings would subside. When does that happen? Who will be resurrected from this gaping hole of emotions? As the days progressed into weeks some of my characteristics showed up, though not all of them desirable. Cassie, my beloved, would say that she was amazed by how my sense of humor remained intact. Even in the emergency room we giggled and laughed. The first few days are still a blur to me, though I recall certain events they have a dreamy quality about them. Dreamy was the quality of everything, to be honest. It was so constant I asked if this was forever now. Cassie listened to my questions, worried with me, supported me, held me when I cried, nourished me with her love and kindness. She was the Connection card for me. When Cassie was present all was as it should be. When Cassie was present all was as it should be. Emotions are fluid like water. Mine were a raging monsoon. Extreme, fleeting, intense, unstable. Cassie always found a way to help me, to calm me, to create safety in her arms. How she did it I do not know, but to my eternal heartfelt gratitude, she did. I would learn more about our connection in the coming months. We have been together many times. Cassie had saved my life, again. After the first few months passed I experienced a strong feeling to reach out beyond western medicine. Driven to take charge of my life again, I followed my expanding senses into the metaphysical world. 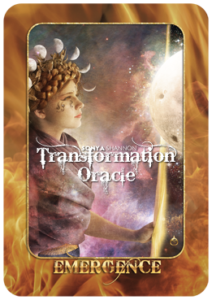 The Receptivity card speaks to my growing intuition, to how I listened to the new guidance I was receiving, and re-discovered the Akashic Records. When I was working within the Akashics I had none of the symptoms of my concussion. My mind was clear. No headaches or confusion, no vertigo or jumpiness. I embarked on a spiritual adventure to help others with the knowledge of the cosmos. I learned of endless possibilities, to hear the tones of the Universe. Receptivity to all that is. Refinement of my Divine gifts began. 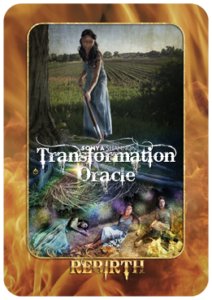 The Emergence card describes how my path unfolded as a result of my a blessed new beginning. I now identified with more compassion and understanding for others and myself. Spiritual evolution had gifted me with the truth of who I am. As my empathic abilities grew, so did my understanding of those around me. Having shed my cocoon, the phases of transformation created beauty in all places. A new fire burned inside to explore my Spirituality. Perspective is interesting in that only slight tweaks can have immense impact. I now viewed everything in a new way, understanding the Universe from a strengthened platform. With time, my brain was healing. Small steps on some days. Leaps and epiphanies on others. The Strengthen card represents how I began to feel the warrior within again. Through trust in myself, I could feel courage returning. When I looked into the mirror I saw myself clearly. My reflection showed me that I could be calm within. I could dispel fears with clarity and understanding, burning away that which no longer served. I found that the more I used my Divine gifts the more I would grow. My journey continues. My life is the happiest it has ever been. Cassie and I have sanctuary within our walls and each other. 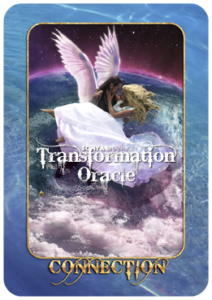 I often look to the Transformation Oracle cards for guidance, even when everything is perfect. 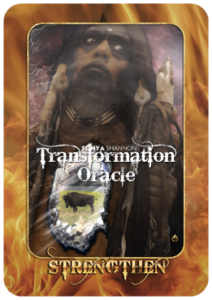 No question or inquiry is too big or too small for the Transformation Oracle. This deck has brought clarity to so many situations that benefited from a tiny shift in perspective. For me, and those I read for, there is always a synchronicity present while telling a genuine story when these cards are turned over. They have helped me explore and expand my Divine gifts, allowing me to share all that I am with others. 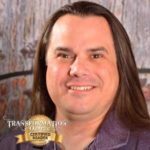 Learn how you can become a Certified Transformation Oracle Reader like Jason Antalek!